The project is an open source project. It aims at developing a computational platform designed to carry out industrial studies on uncertainty processing and risk analysis. This platform is intended to be released as an open source contribution to a wide audience whose technical skills are very diverse. Another goal of the project is to make the community of users ultimately responsible for the platform and its evolution by contributing to its maintenance and developing new functions. to inform external users about the platform’s architecture and its design, in order to facilitate their first steps with the platform. portable: the ability to build, execute and validate the application in different environments (operating system, hardware platform as well as software environment) based on a single set of source code files. extensible: the possibility to add new functions to the application with a minimal impact on the existing code. upgradable: the ability to control the impact of a replacement or a change on the technical architecture, following an upgrade of the technical infrastructure (such as the replacement of one tool by another or the use of a new storage format). durable: the technical choices must have a lifespan comparable to the application’s while relying on standard and/or open source solutions. This chapter will describe the general design of and a few design models that are widely used within the platform. The core of the platform is a C++ library made of about 500 classes of various size. 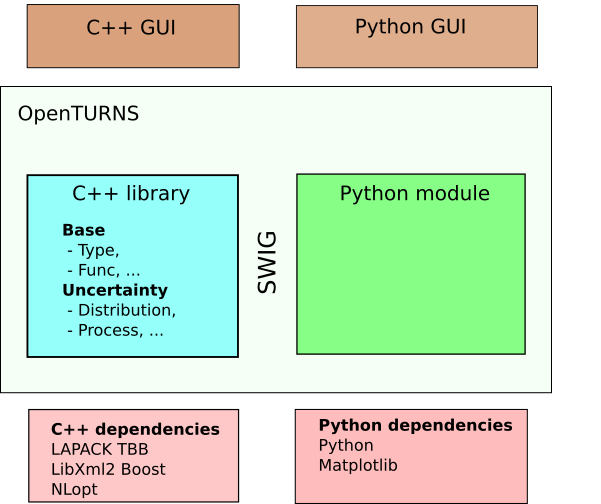 The main user interface is a python module, automatically generated from the C++ library using the wrapping software SWIG. It allows for a usage through python scripts of any level of complexity. The library relies on relatively few dependencies, (Lapack, R, TBB, LibXml2), and most of them are optional. Several GUIs have already been built on top of the C++ library or the Python module. A service of modules is provided in order to extend the capabilities of the platform from the outside. The library has a multi-layered architecture materialized by the source tree. The two main layers in the C++ library are the Base layer and the Uncertainty layer. A class in the Uncertainty layer can use any class in the Base or the Uncertainty layer. A class in the Base layer can ONLY USE classes in the Base layer. There is a unique point where to prevent concurrent access in a parallel context, which is a key property for parallelism. The binding of the library is done almost automatically by SWIG (Simplified Wrapper Interface Generator) through a set of SWIG interface files (.i). The main target language is python. These swig files contain some specific ’glue code’ to each class for the target script language. 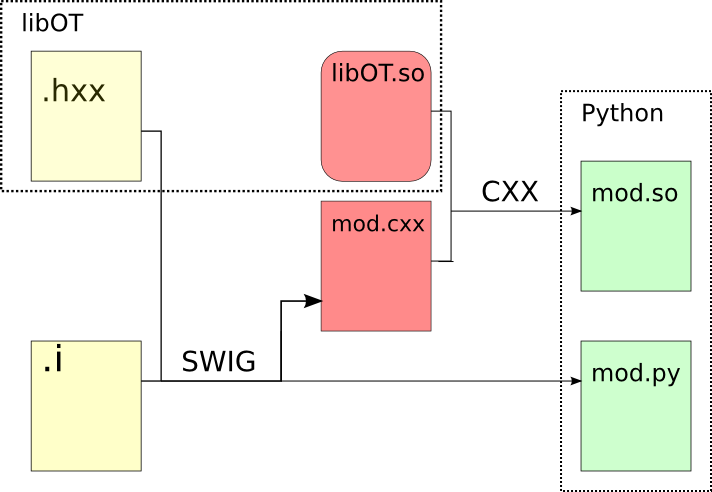 SWIG parses the library headers and theses swig interface files to generates the corresponding module source yet to be compiled to produce a binary python module, see [fig:swig]. The process is shared between several modules for modularity and to speed up compilation time with parallel builds. This section details the technical elements required by the OpenTURNS platform, namely the system requirements, the tools and the development environment of the project. The OpenTURNS platform is meant to carry out uncertainty treatment studies in a scientific environment. Most of the scientific codes being available on Unix platforms, OpenTURNS is naturally designed to run on this family of systems. Unix being a standard with multiple implementations, available on different architectures, this gives a wide choice of target platforms. Linux is currently the most attractive Unix system for the OpenTURNS project, it was chosen as the main target system for the project’s development as well as for the delivery of the different versions. The primary development platform is Linux, and is known to work on various other distributions. The Windows version is obtained by cross-compilation using MinGW-w64. The versions given here are only meant as indications of minimum version and newer ones may be used. CMake could also provide a way to compile the Windows version using Microsoft compilers. The team officially provides binaries for the Debian operating system, and Windows. Note that is officially supported in Debian: it can be installed easily from the debian software repositories. Experimental packages may be available for some RPM-based distributions such as Fedora, CentOS and openSUSE. The project provides developers a continuous integration environment. It consists in an daemon monitoring the version control software for changes. It assumes new code to be involved in regression test. Also developers should regularly commit to the code base to ensure the origin of a problem is quickly detected. The autobuilder is triggered at each pull-request. The result of the autobuilder made public to anyone registered to the mailing list commits@openturns.org. A summary of each build is provided by mail with links to the logs stored on the server. Software design shows the recurrence of some patterns, whether within the same piece of software or in several applications (which can differ in many ways). These patterns have been catalogued, described and implemented in numerous situations that prove their universality and their ability to solve recurring problems that the software architect is faced with. The following sections give an overview intended as much for the reader’s understanding of the document as to establish a common vocabulary for software architect. The latter ones will find here standard design diagrams applied to the specific case of , which can help them better apprehend the tool’s specificities and the design and implementation choices that were made. When a class varies often, the features of object-oriented programming become very useful because changes to a program’s code can be made easily with minimal prior knowledge about the program. The bridge pattern is useful when both the class as well as what it does vary often. The class itself can be thought of as the implementation and what the class can do as the abstraction. The bridge pattern can also be thought of as two layers of abstraction. Distribution, see [fig:bridge], that exposes a high level interface of the concept of probability distribution whereas the DistributionImplementation class exposes the low level interface of the same concept. 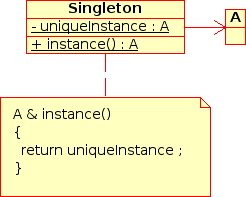 The Singleton is a pattern used to ensure that at any given time, there is only one instance of a class (A); it provides an access point for this unique instance. This is implemented by creating a class (Singleton) with a static private attribute (uniqueInstance) initialized with an instance of class A and whose reference (or pointer) is returned by a static method (instance). Figure [fig:singleton] illustrates the Singleton pattern. It is a very common pattern that allows to find and share an object (which must remain unique) in different portions of code. Examples of such objects include shared hardware resources (standard output, error, log, etc. ), but also internal functions that cannot or must not be duplicated (e.g. a random number generator). For example, the classes ResourceMap and IdFactory follow this pattern. This pattern allows to define a unique interface for the creation of objects belonging to a class hierarchy without knowing in advance their exact type. Figure [fig:factory] illustrates this pattern. The creation of the concrete object (ClassA or ClassB) is delegated to a sub-class (ClassAFactory or ClassBFactory) which chooses the type of object to be created and the strategy to be used to create it. This pattern is often used to dynamically create objects belonging to related types (e.g. to instantiate objects within a GUI according to the user’s behavior). It can also be used to back up and read again a document written in a file by automatically re-instantiating objects. It is a pattern that makes code maintenance easier by clearly separating the objects and their instantiation in distinct and parallel class hierarchies. For example, the classes DistributionFactory, ApproximationAlgorithmImplementationFactory, BasisSequenceFactory follow this pattern. The Strategy pattern defines a family of algorithm and makes them interchangeable as far as the client is concerned. Access to these algorithms is provided by a unique interface which encapsulates the algorithms’ implementation. Therefore, the implementation can change without the client being aware of it. This pattern is very useful to provide a client with different implementations of an algorithm which are equivalent from a functional point of view. It can be noted that the Factory pattern described earlier makes use of the Strategy pattern. For example, the classes ComparisonOperator, HistoryStrategy follow this pattern. The Composite pattern is used to organize objects into a tree structure that represents the hierarchies between component and composite objects. It hides the complex structure of the object from the client handling the object. Figure [fig:composite_tree] shows an example of tree modeled by the Composite. The Composite objects make up the tree nodes whereas the leaves can be any concrete object deriving from Component. The Composite pattern is an essential element of the design model for the platform. It can be used to model numerical function composition, random vector composition, etc. It can be found in several aspects of the modeling brick. 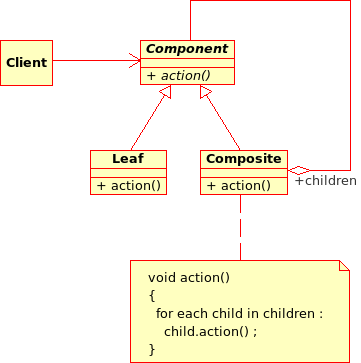 Any related objects tree structure can rely on the Composite pattern with benefit. For example, the classes ComposedDistribution, CompositeRandomVector, ComposedFunction follow this pattern.